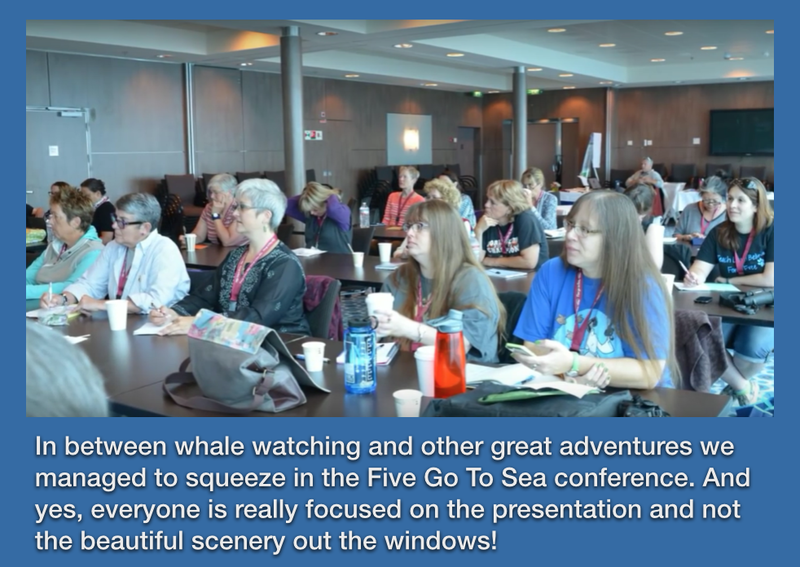 Labor Day weekend seems like a good time to post this report on the Five Go To Sea conference and the August clinics. It’s taken me a while to put it together. The problem with heading off on a summer of adventures is at some point you come bumping back into reality. That happened to me when I returned from three weeks of travel. I got home to find the hot water heater in my house was leaking and the tank was sizzling ominously. I turned off everything I could find that was even remotely connected to the hot water tank and headed off to spend the night at the barn. Thursday got the hot water tank replaced. Friday a repair man came to fix the snowblower that wouldn’t start last winter. I know the first snowfall is still a fair way off, but waiting until November to get it fixed is a bad idea. Just to round things out, I also took my aged truck in for servicing. I was learning that these machines have one thing in common with our brains. They all operate under a use it or lose it principle. 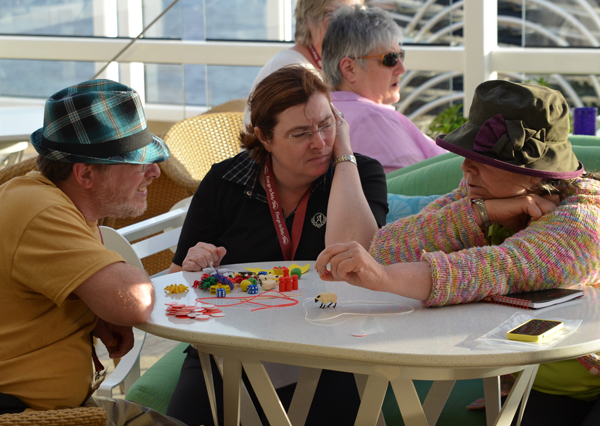 Our brains thrive on novelty and that was certainly provided by the Five Go To Sea conference cruise. The first cruise took us to the Caribbean. This year we sailed up the Alaska coastline. 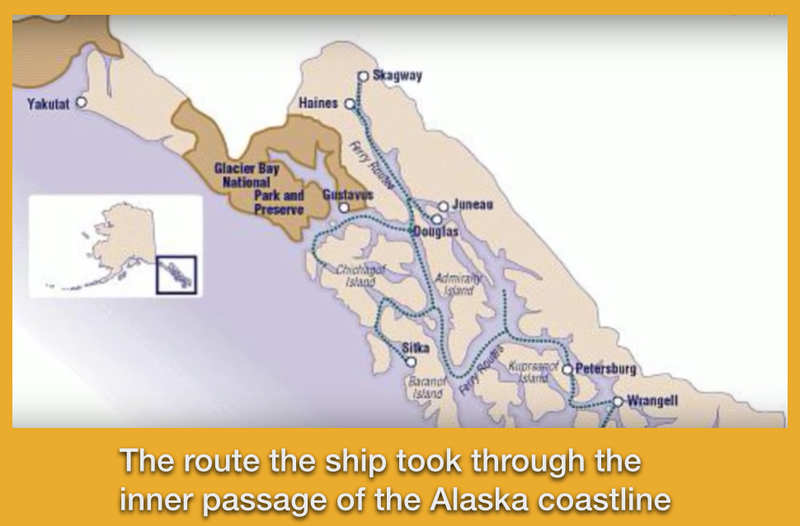 The route the ship took was through what is referred to as the inner passage. 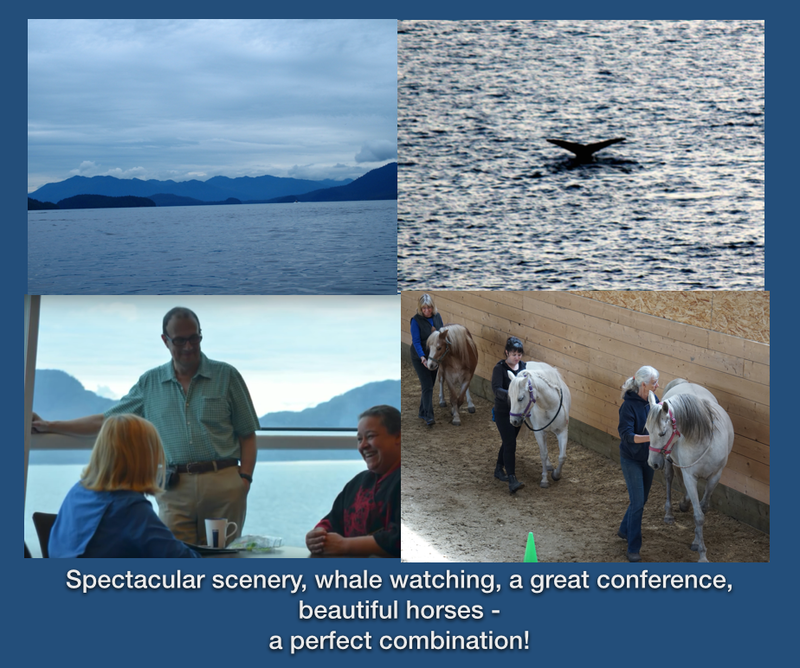 It travels between islands and through spectacular fjords so it doesn’t matter where you are on the ship, there is always something breathtaking to look at. Our conference room had floor to ceiling windows so we didn’t miss out by being in a conference. By the end of the first day, I think we were all in agreement that every conference from now on should provide a similar spectacular backdrop. It certainly gave us some memorable conference moments. 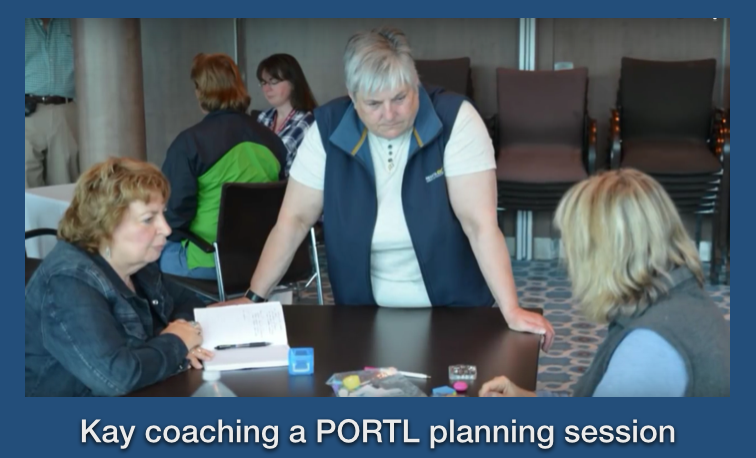 One such moment occurred during a presentation Kay was giving on PORTL, a training table game. Kay was in the middle of a demonstration. She was working with one of the conference attendees showing everyone how to get the game started. Her learner made an unexpected move that Kay had not planned for. Kay began to talk about these “oh, oops” moments. Do you have a strategy in place to deal with this kind of situation? How do you move on without confusing or frustrating your learner? She had barely posed the question when one of our keen spotters cried “whale!” and everyone, Kay included, rushed to the windows. Apparently, that’s what you do. By the time we returned to the game the sticky moment was completely forgotten! It helps to bring along your own naturalist on these cruises. Ken Ramirez isn’t just a first class trainer. Not surprisingly, he’s also an expert whale spotter, and he could tell us what we were looking at based on the size and shape of a quickly glanced spout. My first whale sightings were just that. A fleeting glimpse of a very distant spout. 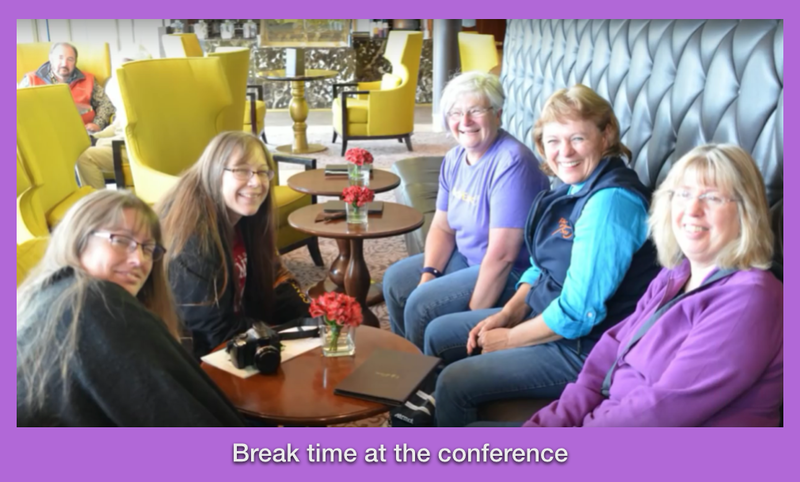 But in Juneau I joined four of the conference participants for a whale watching tour. 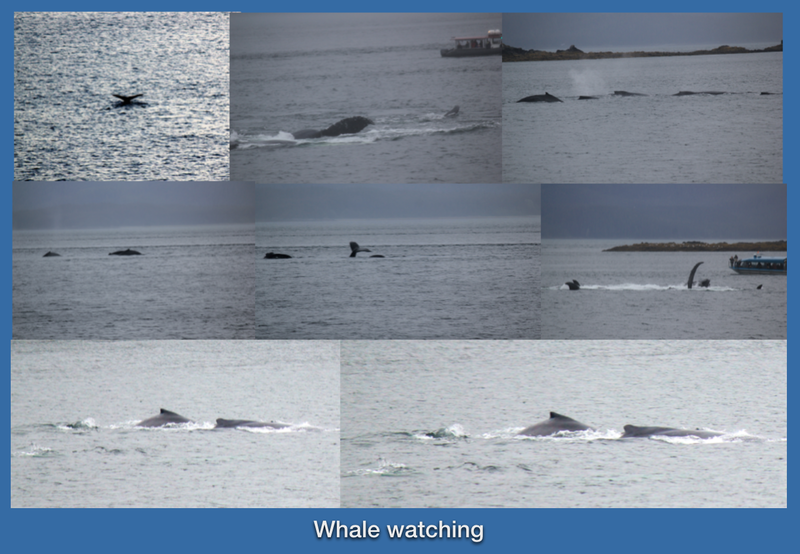 In addition to seeing some spectacular scenery, we had close up views of hump back whales. 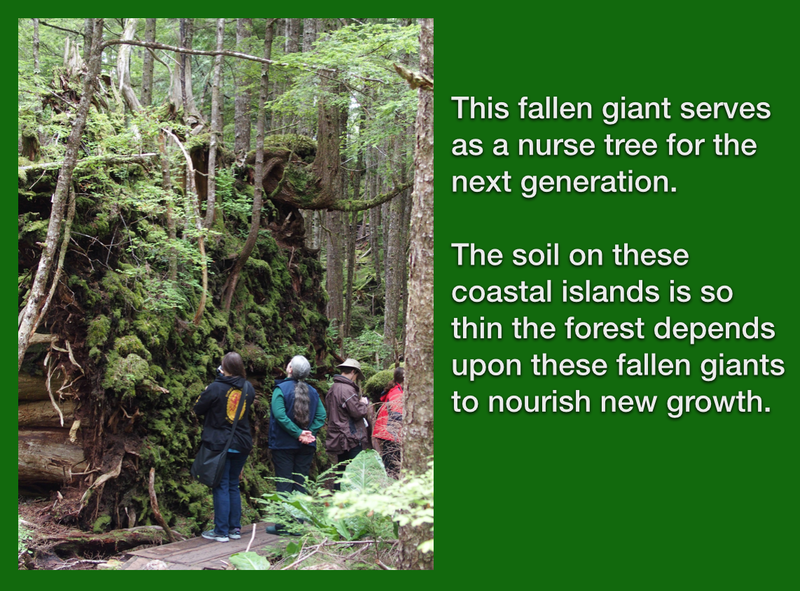 Other trip highlights included a hike through the coastal rainforest. I’m not sure what I was expecting, but it wasn’t this. Moss covered trees created a magical landscape. I spotted a large hole disappearing under the roots of one massive tree. “What would live in there?” I asked our guide. She gave me a general answer, running down the list of small mammals that inhabit these forests. What she left off her list were elves, brownies and fairies. In a woods like this they were just as likely to be the inhabitants of this hidden cavity as any martin or rabbit. 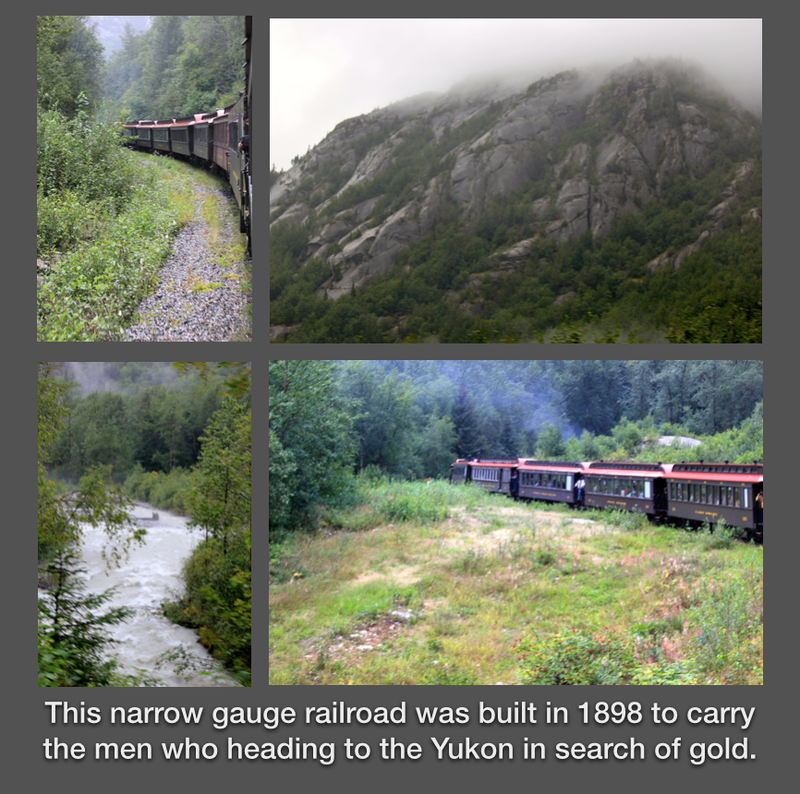 At Skagway I boarded a train that followed the route the “Stampeders” took in the late 1800s on their journey to the Yukon in search of gold. You have to wonder at the mass insanity that overtakes people. Riding in the comfort of an old-fashioned train, I could marvel at the beauty of deep river gorges. But if I had to carry a year’s worth of supplies up these same mountains, would I have thought they were beautiful? 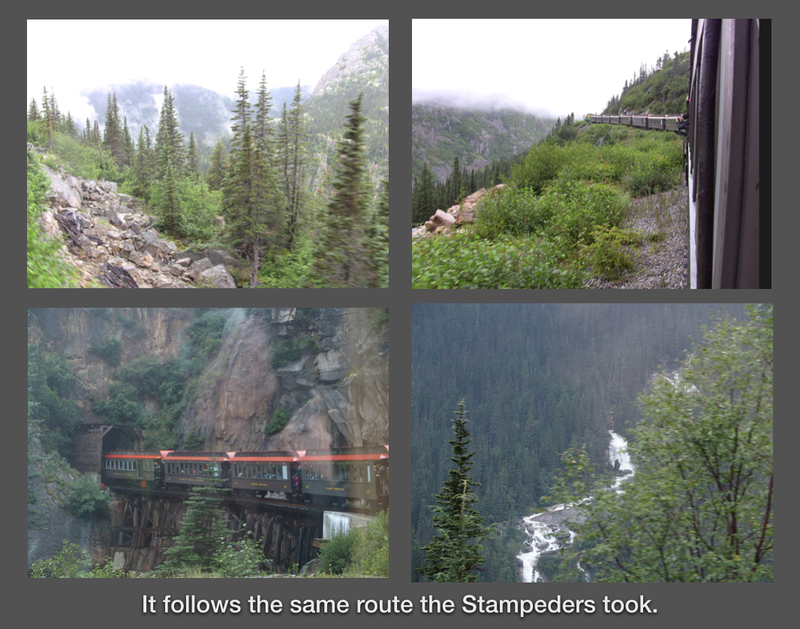 The train was built in 1898 to carry the Stampeders to the gold fields of the Yukon. Today it brings gold in the form of tourist dollars into the area. 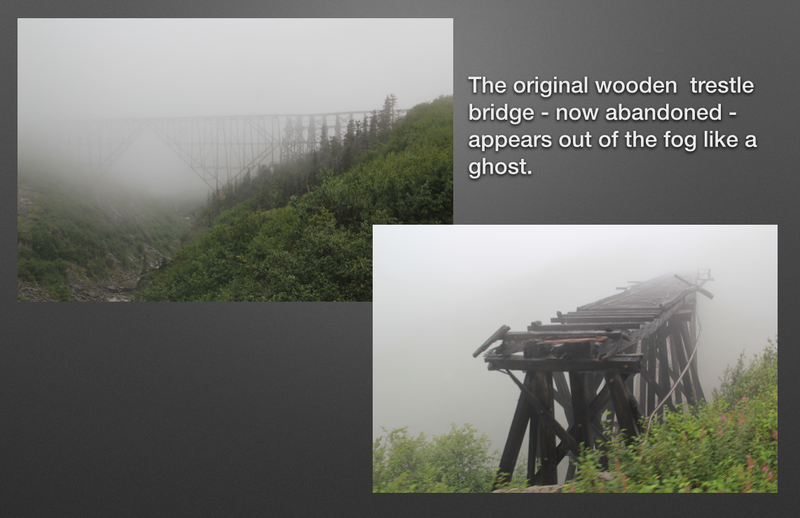 The train passes through a section of trail called “Dead Horse Pass”. It’s estimated that over three thousand horses and mules died along this stretch of trail. Ignorance was the culprit. The shop assistants and mill workers who were racing to the gold fields knew nothing about how to balance a pack. They didn’t even really know where the Yukon was or what kind of conditions they were heading into. Pictures taken of them in San Francisco before they headed north to the gold fields showed prospectors posing in front of painted mountain scenes with palm trees in the foreground! 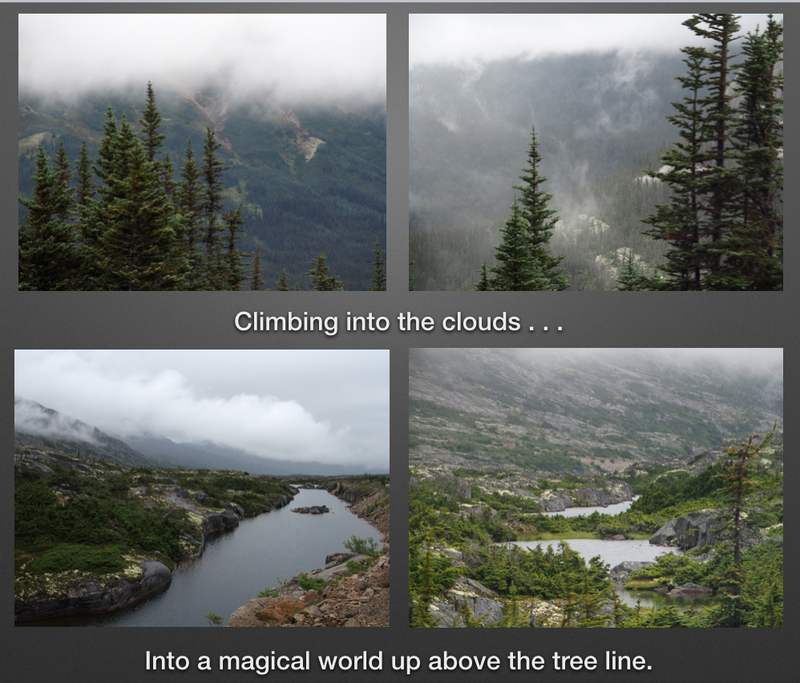 But it wasn’t palm trees that they encountered as they drove their over packed horses up the White Pass Summit. I thought of these horses as the train passed through this section of the trail. I think of them now as I write this in my barn where my very pampered horses get to live a life of great comfort. 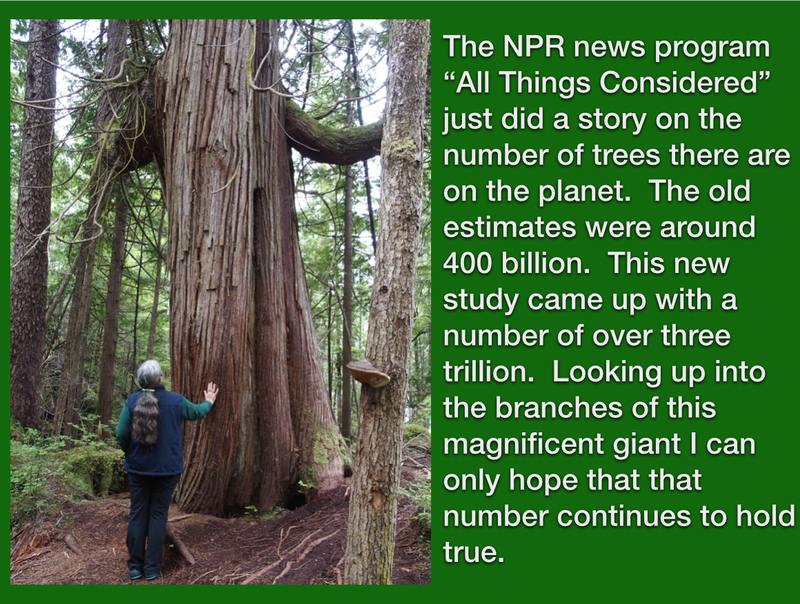 Perhaps it balances the scale just a little. Throughout our history with horses we have a lot to answer for. We met a very different kind of horse in the Butchart Garden in Victoria, British Columbia. 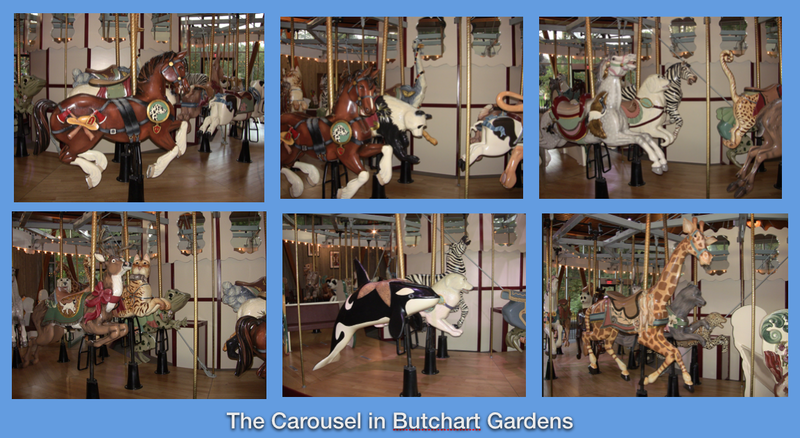 Along with a delightful giraffe, a camel, an ostrich, a reindeer, and a large cat with a salmon in its mouth, the horses pranced around an old-fashioned Carousel. We wanted to ride them all, so we ended up taking several turns on the Carousel. I rode a rabbit and, in honor of Kay, a large white dog. One of us should have ridden the Orca, but we were running out of time. The garden closed at nine, and we didn’t want to miss the bus that would take us back to the ship. Did I mention that we also spent our days at sea in the conference room? Ken treated us to an update on the training he’s been doing teaching dogs to count. I had requested that for the day that I organized. The results of his experiment are impressive, but what I particularly wanted him to include were the preliminary steps he goes through to design a good training set up. So many of us simply jump straight into training. We find out too late that we can’t really manage our props, that our set up is clumsy, and we haven’t given any thought to all the things that can – and now are going wrong. Ken showed how a bit of training practice without any dogs revealed some major issues in his original set up. He also showed his clumsy first attempt when he was still evolving the best training procedure to use. He refers to this as exploratory training. What do you need to change before you begin the real task of training and data collection? Ken is such a skilled and creative trainer, it was good to see things going wrong for him in this early phase of the training. This isn’t to gloat but to understand that this planning phase is part of good training. He also shared with us his recent foray into butterfly training. He couldn’t show us any video, but his detailed description of the training process was a definite trip highlight. I don’t know which surprised us more – that butterflies could be trained or that butterflies could be bullies. Kay focused much of her time on the training game, PORTL. She divided people up into groups of three: a learner, a teacher and a coach. The first tasks were fairly simple. The teacher was to introduce the learner to the game. Kay instructed them to plan thoroughly before they brought in their learner. What were they going to do if their learner did something unexpected, if there was a bad click, if they got stuck and needed to consult with the coach? With Ken’s emphasis the day before on planning the teachers and coaches took this training prep very seriously. Normally people rush through this part of the process. They jump right in with their learners and then don’t have any plan for dealing with the unexpected. You see that kind of approach creating a lot of frustration on both sides of the table. Not so with this group. More than half an hour went by and none of the learners had been called in. The teachers and coaches were still engaged in careful planning. The poor learners weren’t sure what they were supposed to do. No one had anticipated this contingency – that the prep would be so very comprehensive. The advantage of being on a cruise ship is we could send them off to get a drink or to whale watch while the rest of their team planned out their training strategy. We learned from this experience. On the last day of the conference we again played PORTL. This time Kay set more challenging tasks which definitely required some planning time. I took the “learners” through some body awareness/training exercises. That produced some interesting results. When the teachers came to get their learners, people didn’t want to leave to go play the game. One “teacher” ran into a training puzzle and needed a moment to think. She told her learner that they would only be a couple of minutes. She could stay at the table while she consulted with her coach. “Oh no”, her learner told her. “Take your time.” She was going back to rejoin the body awareness session. I must say having the backdrop of the open ocean created the perfect setting for body awareness exercises. The gentle pitch and roll of the ship added to the proprioceptive experience. 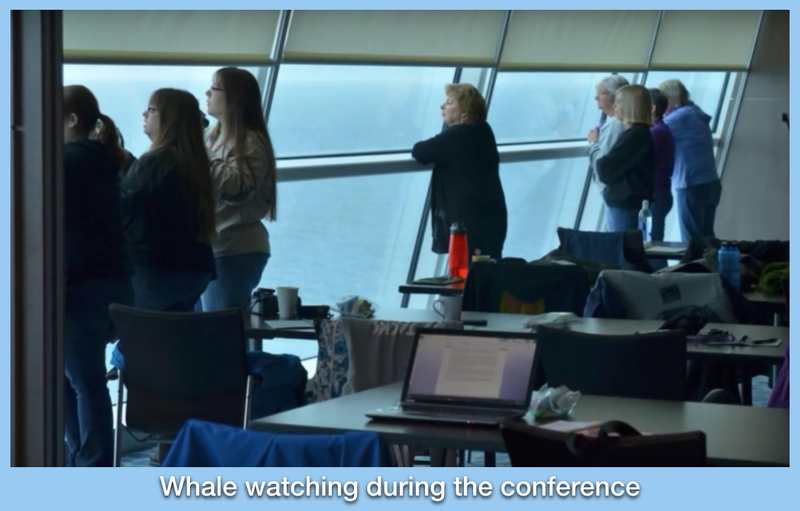 Even the occasional “whale” cue which sent us all rushing to the windows contributed to the learning. How quickly could you come back from a mammoth distraction into a state of calm balance for your animal? And since I was among those who rushed to the window I couldn’t fuss when others did the same. The cruise ended all too soon. When we docked back in Seattle early on Friday morning, I felt as though I could easily have set sail again. Alaska is a landscape I could easily become lost in. We are talking about where to go next. What adventure should we have for our next cruise? I could easily return to Alaska to sail up through the inner passage and see again those magnificent fjords. For those who don’t want to go on a ship, Kay is talking about a land cruise next winter in the UK. I’ll enjoy that as well, but I will also be looking forward to our next ocean adventure. The cruise was over, but not my travels. I headed next to a small clinic at Monty Gwynne’s, one of my Click That Teaches coaches. 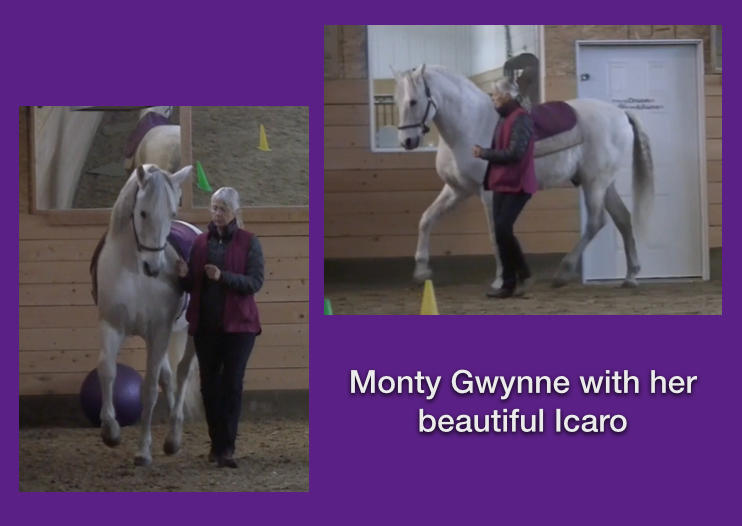 Many of you have met Monty through her wonderful PRE Icaro. Icky is only one of the many horses Monty has trained. She also has a barn full of ponies who have all learned lateral work. They made my job so easy. They were the true teachers. I simply stepped aside and let them teach people how to dance with horses. On the third day we brought three of the horses into the arena for the start of a quadrille. We had originally planned on having six horses working together for our drill team, but two of the participants had to leave early, and the third was busy attending to her own horse. So we settled on just three horses which was enough for everyone’s first attempt at working in sync with one another. Watching them coming down the long side together in shoulder-in was the highlight of my entire trip. What a treat! Monty has a treasure trove of wonderful horses. 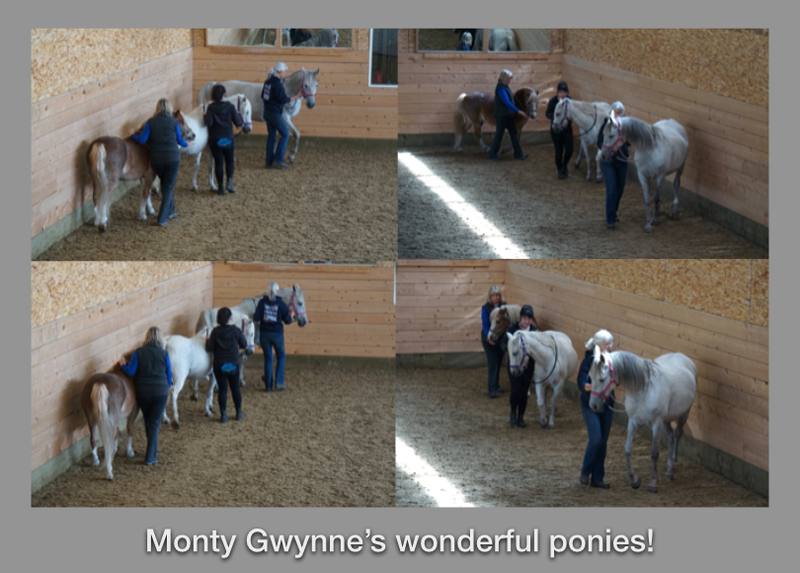 If you want to explore what the combination of clicker training and an understanding of good balance can create, you should plan a trip to visit Monty. 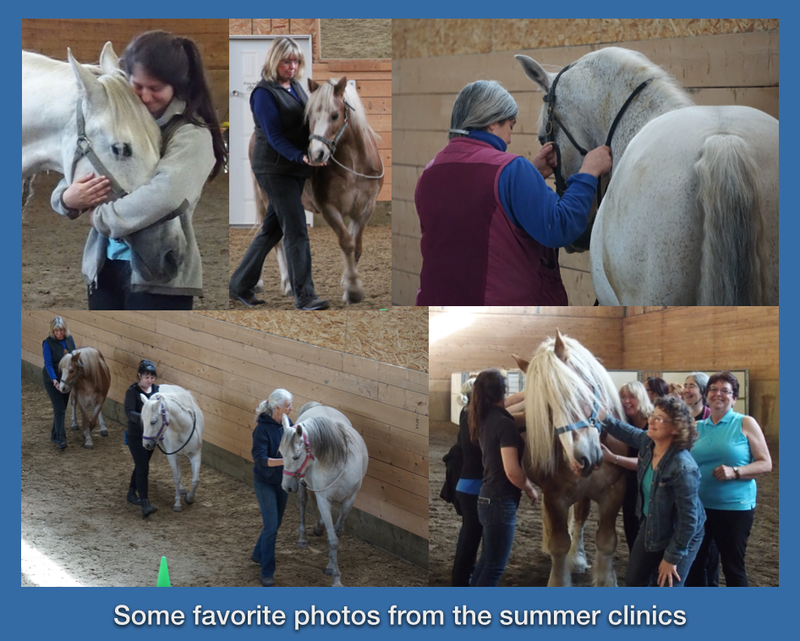 I flew home on Tuesday, spent half a day catching up and then drove to the Cavalia Retirement Farm for a three day clinic. It was another great event. Several of the attendees were brand new to clicker training so the focus this time was on foundation work. One of my Click That Teaches coaches, Sue Bennett, joined us. Having Sue there to help meant we could split up into smaller groups to give people lots of one on one coaching. 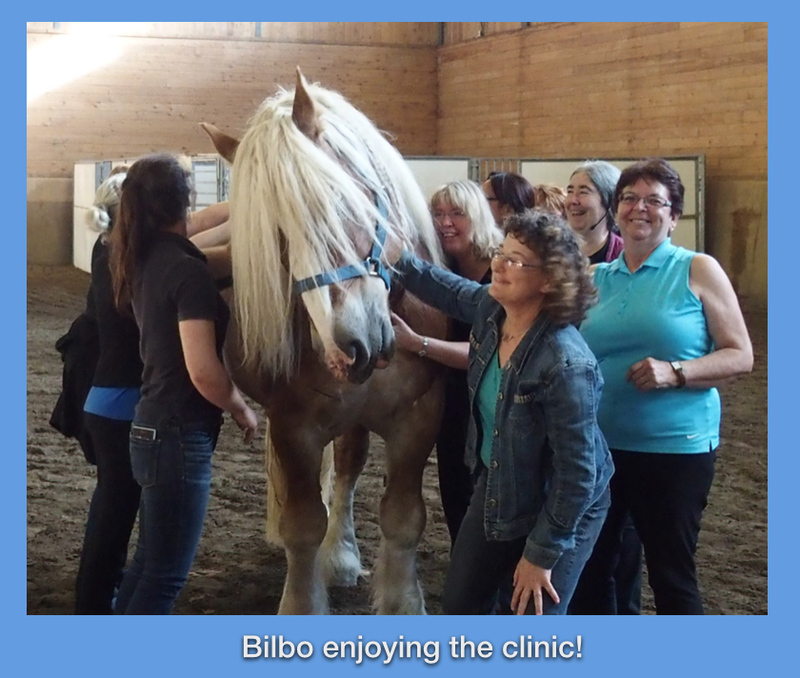 The star of the clinic was Bilbo, an enormous Ardennes daft stallion. When Bilbo enters the arena all eyes are on him, and it isn’t just because he’s so big. Bilbo has charisma. We generally save him for the end of the day. We let him play his version of Panda catch. He’s not as good at it yet as Panda. She runs at full gallop from person to person. I am glad to say Bilbo chooses a more sedate speed. His reward for moving from one station to the next is not just a click and a treat. He also gets a back scratch from everyone in the clinic. He’s so big you can have the entire clinic group around him and everyone can find a spot to scratch. Did I mention that Bilbo likes clinics and wouldn’t mind if they happened every weekend? I enjoy the clinics and all the other adventures, but it is good to be home for a bit. I have pastures to mow, plumbing to fix, and horses to enjoy. The series on Resurgence has generated a lot of interest, and I know from my in-box, also a lot of questions. So I’ve invited Dr. Jesús Rosales-Ruiz and Kay Laurence to join me for an on-line question and answer session. I hope you will join us, as well. Space is limited. If you would like to attend, do sign up early. The meeting is limited to a maximum of 25 people. How do you sign up? Email me at: kurlanda@crisny.org. I will send you a paypal invoice for the meeting. What do you need to participate? For optimum audio quality, a headset is recommended. What should I bring? Lots of questions! If you have not read the previous installments of this series, I suggest you begin with Part 1. Part 1 was published on May 21, 2015. Jesús closed his presentation with two horse examples. The first was Robin’s “pose”. I’ve told the story of the “pose” many times. I’ll keep it brief here. Robin first learned a stationary “pose”. It originally was a by-product of cleaning up his treat taking manners when he was two years old. During the process he started “posing”, arching his neck and looking like a very pretty dressage horse. I liked the look so I continued to reinforce it. It became a default behavior. In the absence of any other active cue from me, if Robin posed, I would click and reinforce him. I became the cue for the behavior. Offering “the pose” meant that if Robin wanted to interact with me and engage in the clicker game, he had a sure fire way of doing so. Even if I was busy doing barn chores, if I saw him posing, I would click and reinforce him. I never wanted him to feel like the proverbial toddler who is banging the kitchen pots and pans to get his mother’s attention. If Robin wanted attention from me, he had a behavior which he could use to satisfy his need for social interaction. Because Robin wasn’t ignored, he didn’t go through an extinction process. I didn’t see a regression into the unwanted behaviors that macro extinctions can cause. Instead I was able to reinforce a behavior I liked, one that was a useful warm up for our formal training sessions. For his part Robin was confident that I would engage with him when he asked for attention. Reinforcing him for the stationary pose went on through the winter. I didn’t have any plans for developing the behavior. It was simply something I liked. It was Robin who was the creative one! It must have been late March. I was lunging him in the arena one evening. He was giving me a ho hum trot. There was nothing there I could reinforce. Robin went once around the circle, twice, three times without reinforcement. Normally I would have been clicking and reinforcing him at a much higher rate, but given the plow horse trot I was presented with, there was nothing there I wanted to say yes to. At the time I would not have described it in these terms, but I was putting him into an extinction process. I could see him searching, trying to decide what to do. On the third time round he had the answer. He would try his pose. But in order to pose and still stay in the trot, he had to add energy. Within one stride he transformed into magazine-cover magnificence. I captured the moment with a click and the rest is history. The “pose” has evolved into a major component of my work. Robin showed us that we could indeed shape self carriage. What began as a happy accident for Robin has become a deliberate and very systematically trained behavior in other horses. First, you build a strong history of reinforcement for the component behaviors. Next, you change the situation somewhat so extinction comes into play. This generates a resurgence of previously reinforced behaviors. The result: new combinations emerge. That’s creativity. The most fun for me is seeing what the horses invent. They are often so much more creative than their human partners! Kay Laurence might say we are seeing familiar landscapes with fresh eyes. Jesús would say you have to understand the process of extinction so you can master it. If you understand it, you won’t be frustrating your animals. Instead, you’ll know how to use extinction to generate complex behaviors. I would say that monitoring the level of extinction your learner is experiencing is a keys-to-the-kingdom part of good training. I recently spent a couple of days working with a group of horses I have come to know well. One of them is a retired performance horse. Without going into a lot of details, I would describe him as an emotionally fragile horse. He’s easily worried. If he thinks he has the right answer, he’s a superstar, but I always have to be careful how far I stretch him into new behaviors. If he thinks he might get something wrong, he worries. He’s come out of a training environment in which he had to perform correctly or his rider could get seriously hurt. I suspect he was corrected for mistakes which accounts for his worry. This past weekend I was working among other things on this horse’s pose. He’s very much got the idea that he gets reinforced for lifting up through his topline and releasing at the poll. I was holding out for slightly better versions. As I withheld my click, I saw him experimenting. Was it higher with his poll? Was it more lift of his back? What did I want? The shifts he was giving me represented micro changes. The variations were all within a clickable range. Clicking him for any of these variations would not have been wrong, but I was waiting fractionally to see what else would pop out. I was using micro extinctions to create the next step. And because I was thinking about this in terms of extinction, I was monitoring closely how this related to his emotional level. I did not want him to become macro worried. We were always just a second or two away from a click so I could let him experiment within a micro extinction without risking the emotional fallout of a larger extinction process. Micro is so very much the key. Macro extinctions are painful. Micro extinctions are part of good shaping. Macro shaping can be frustrating. Micro shaping is elegant. Macro negative reinforcement is literally painful. Micro is again good shaping. When you go micro, your learner is always just a second or two away from a reinforceable moment. You can cue another behavior. You can click and treat. Either way, you are saying: “Yes! Great idea!” Micro mastery is what we should be striving for in our training. When you say someone is a great trainer, you are saying he is a Micro Master. In training that’s the “black belt” we should be aiming for. This concludes the report on Dr. Jesús Rosales’ Ruis’ 2014 presentation on Resurgence and Regression given at the Five Go To Sea conference cruise. Jesús reminded us that nothing is either all good or all bad. We want to use positive reinforcement with our animals because we see it as effective and more humane. But positive reinforcement doesn’t always produce desirable outcomes. In people it can lead to addictions to harmful behaviors such as over eating or gambling. Jesús again used PORTL to illustrate how this can work. 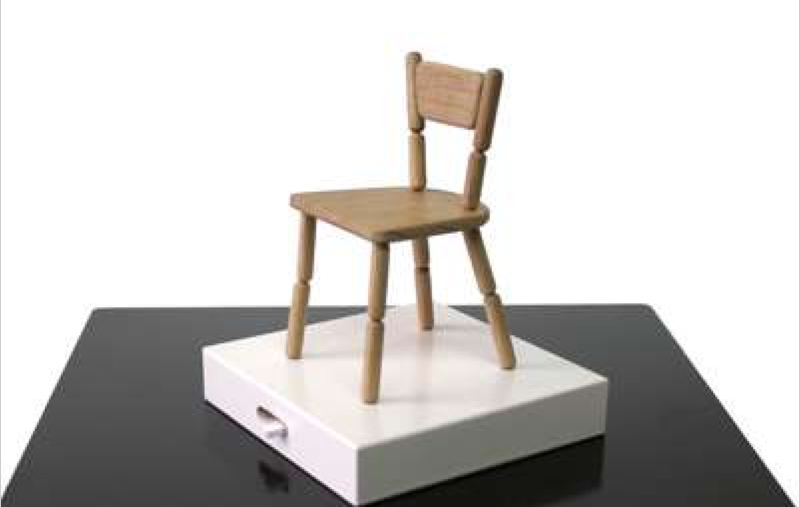 In one video example, a trainer set a toy chair on the table for her learner to interact with. The goal was to get the learner to push the chair over the table the way she might push a toy car. The learner began to interact with the chair, but not in a way that would lead to pushing it. Why? Because history matters. The learner is going to bring back all of her history, all of her previous repertoire of chair behaviors as she experiments. Pushing it like a car is very unlikely because that’s not how she would have interacted with this kind of object in the past. The same would be true if the trainer had set down a dice. The learner would have tossed the dice or shaken it in her hand because that’s in the reinforcement history of that object. Pushing a dice over the table like a toy car would probably be much harder to get. Instead of trying to shape the behavior through small approximations, the trainer used resurgence. Her first step was getting the learner to touch the chair consistently. The learner in this video was not particularly creative. She touched the chair, but she didn’t try any other behaviors. Getting her to push it was going to be hard. So the trainer took the chair away and set out a toy car. Using an object that normally would be pushed made it very easy to get the desired behavior. The learner pushed the car over the table top. Click and treat. This was repeated several times and then the trainer took the car away and set the chair out. The learner went back to touching it. The chair accidentally fell over – click and treat. The learner latched on to that, expanding her repertoire to two behaviors – touching the chair and knocking it over. She persisted in knocking it over even when she did not get reinforced for the action. Everything but pushing it like a car was put on extinction – meaning the trainer no longer reinforced her for these behaviors. To avoid escalating the learner’s frustration, the trainer took the chair away and set the car out again. The learner immediately started pushing the car over the table top. Click and treat. To help with the generalization the trainer put a third object out – a small block. The learner pushed the block. Click and treat. This was repeated several times, then the trainer took the block away and set out the car. The car was pushed. Click and treat. The trainer set the chair out and the learner pushed the chair. Job done. Jesús next showed an example of using resurgence to train a dog to step with his hind legs onto a chair. The dog was taught through a series of very carefully managed steps. First, the dog learned to stand one foot each on four small plastic pods. This alone was impressive training. The pods were the same ones physiotherapists use to help people improve their balance and proprioception. It took great coordination for the dog to stay balanced on the four pods. But that was only step 1. Next he learned to keep his front feet on the pods while he maneuvered his hind feet up onto the brick ledge of a fireplace hearth. This was not done as a cute party trick. The dog’s owner is a yoga teacher. Her interest was very much the same as mine – helping her animal to maintain a healthy spine. Jesús commented that if we didn’t know about resurgence we would be saying the dog generalized. But generalization had nothing to do with it. What we were seeing was resurgence. Kay added that for her this process is what is meant by creativity. It isn’t waiting and waiting for the dog to do something new. Instead we give them a whole range of behaviors, and they come up with a new or unlikely combination. What Jesús was showing us was a procedure for setting up the creative process. You give the animal the repertoire, the components of more complex behaviors, and then you set up a puzzle and let extinction be the catalyst for solving it. If you are new to this series, I suggest you begin with Part 1. How do you help horses and handlers to become more optimistic puzzle solvers? One way is to expand the repertoire of both the handler and the learner. The broader and more extensive the repertoire, the more options an individual has. If a horse knows only two choices and neither of them are working, he’s in trouble. Jesús referred to this as being coerced by your repertoire. Here’s the example: suppose a high school student is a great debater. In fact he’s so good, he’s captain of the debating team. You’d expect someone like that to have a really high self-esteem. He’s so successful how could he not? But look a little closer, and you’ll see why. This individual is great at debating, but he’s no athlete. He’s left out of a lot of other school events. He doesn’t play sports. He doesn’t go to school dances. He has poor social skills so at lunch he’s off by himself. Yes, in debating he wins all the prizes, but he has only that one skill. So he’s being coerced into improving his debating skills because that’s all he can do. He’s the best debater in the school, but that doesn’t keep him from feeling left out and miserable. With only that one skill he has only one degree of freedom. Other members of the debating team may not be as good as he is, but they are also involved in other school activities. Compared to him they have three or four degrees of freedom, and they are much happier. The captain of the debating team is the best, but he’s been coerced into that position because he has no choices. For him, as well as for our horses, the way to improve his emotional well-being is to expand his repertoire so he has more reinforcing activities available to him. Kay Laurence confirmed this approach for dogs. If you’re working with an aggressive dog, you want to expand his repertoire. Teach him a dozen new behaviors: turning your head to the left, to the right, lifting a paw, walking in a circle, touching a target, etc.. Now in a threatening situation he has a dozen new ways to respond, instead of just the two or three that he started with. Jesús dropped in another gem at this point by reiterating that when we talk about emotional behavior such as aggression, we are forgetting that we are always emotional. It isn’t that now we are happy, and then a switch turns off and we feel nothing. The nature and intensity of the emotions fluctuates. We experience different degrees depending upon conditions and our reinforcement history. But thinking in terms of “emotional behavior” is too simplistic. Emotion is part of all behavior. It is not separate from it. 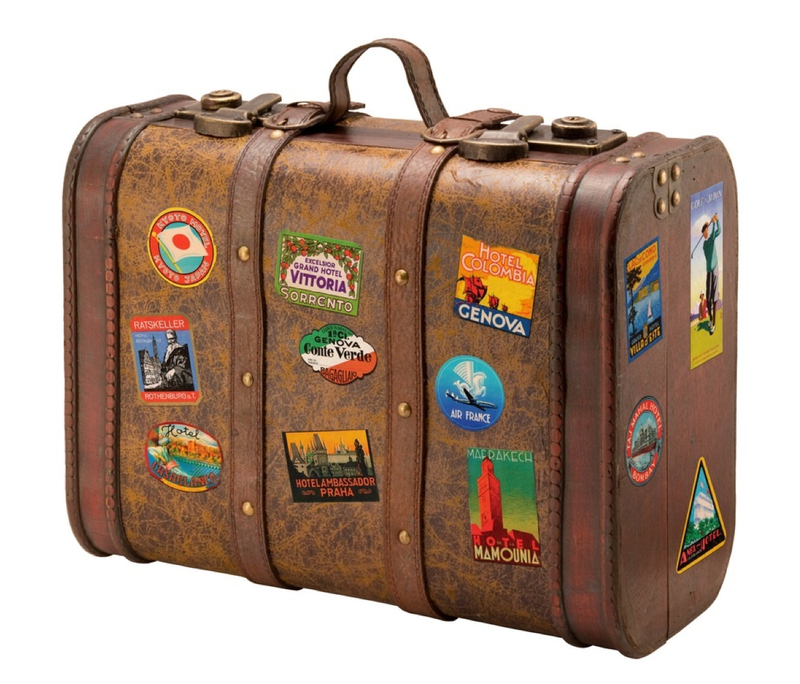 Traveling helps you to understand how much our emotions are a product of the habit patterns that have formed within our familiar environments and how universally present emotions are. Perhaps you are one of the huge number of people who have more to do than you could possibly accomplish in one day. You have a family to care for, a house and barn to maintain, horses to feed and clean up after – not to mention ride. All that and then there’s also an overfull schedule at work. You’re always under stress, but it’s become so the norm, you don’t pay much attention to how you’re feeling. A mildly stressed state is the normal background. And then you treat yourself to the Five Go To Sea cruise where everything is different. You still have a full day, with more to do and see than any one person could possibly squeeze into a day, but your normal triggers aren’t there. The phone isn’t ringing. You aren’t on the internet with the constant influx of work-related emails. Your co-worker’s voice coming through the office wall isn’t annoying you. All those triggers are gone and now you get to experience who you are and how you feel without them. You become acutely aware of just how stressed you’ve been now that you’ve stepped out of your normal habit patterns and can experience the contrast. You’re still emotional, but now the environment is set up to trigger the kinds of supportive, pleasant emotions you want to experience. That’s the kind of positive environment I want to create for my learners: one in which puzzle solving is fun, and both horses and handlers eagerly seek it out. On a Caribbean cruise what do clicker enthusiats do for fun? They play PORTL games.